As content marketing becomes increasingly visual, it’s important that marketers are able to efficiently and accurately leverage data visualization. Otherwise, it’s possible that all of your analytics and data collection efforts could be wasted in a myriad of words and numbers. Thankfully, it’s not extremely challenging or demanding to create vibrant and clear visualizations. As marketers, we have access to lots of data. And while there’s rarely a shortage of information available, the challenge is consolidating this information into something that can be digested by readers. You’ve probably heard the KISS acronym, which stands for “Keep it Simple Stupid.” Well, this rule applies to data visualization. If you want to keep readers focused and moving towards a particular conversion goal or call to action, it’s important that you keep the visualizations simple and straightforward. Different types of visualizations exist for different situations. While choosing the correct data points is most important, don’t underestimate the need to choose the appropriate format. A pie chart may work in one situation, but would a line graph be better in another? Think about the message you’re trying to convey and then choose the format that allows users to clearly understand the takeaway. Here’s a helpful guide to choosing the right format for any situation. One of the most valuable tools you have is color. When developing visualizations, color can be used to add emphasis, draw connections between different graphs, or highlight particular data points. Use color when you need to help the reader draw the right conclusion and be aware of how different shades, hues, and tones communicate different messages. For example, green is considered positive, whereas red may be seen as alarming. 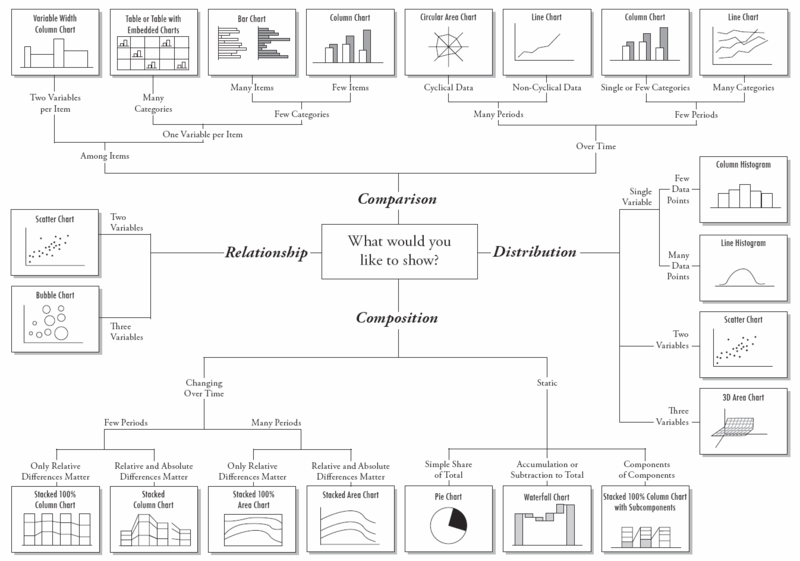 One problem that people often encounter is creating a visualization in one format only to publish it in another. This frequently results in distorted images that are blurry, grainy, or otherwise unreadable. To avoid distortion, it’s important that you design visualizations in high-quality formats that can be scaled up or down according to the needs of the final format. Any time you use a chart or graph, it needs to pass the “squint test.” In other words, when you squint at the page, are you still able to get anything from it? Or is it useless? The squint test simply provides a quick way to gauge whether or not the visualizations you’re using are effective. In the marketing world, you could say that data visualization is the new black. Readers are becoming more accustomed to sleek charts and beautiful imagery, which means black text on a white screen no longer does the job. If you want to maximize the value of your data and engage with users, it’s important that you learn how to satisfy this demand for better visualization. Use the tips mentioned in this article to get started. Thank you for these useful tips! I’ve got interesting things there. Agreed that visualization is a critical element of the data publishing. So it’s very important to implement different graphic/video/etc. solutions for it.